What could be better than getting FREE stamps and supplies? I mean seriously??? I don't know about you but I'm loving Sale-A-Bration so far. I've found tons of different ways to used just about all of the products I've earned so far and I'm nowhere close to being done. 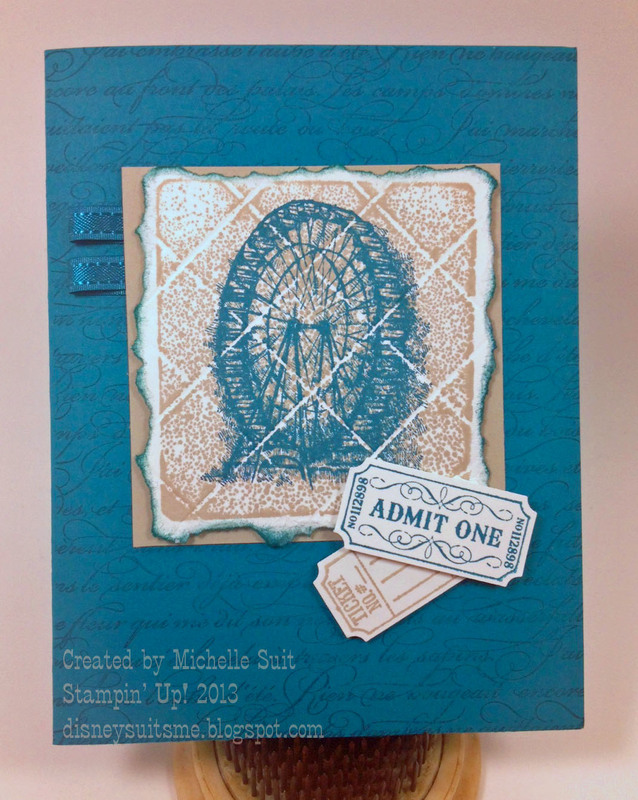 To add a little added "vintage" feel....it's spritzed with the Stampin' Spritzer Tool and an Island Indigo Marker. Fun, huh? The card base is Island Indigo. 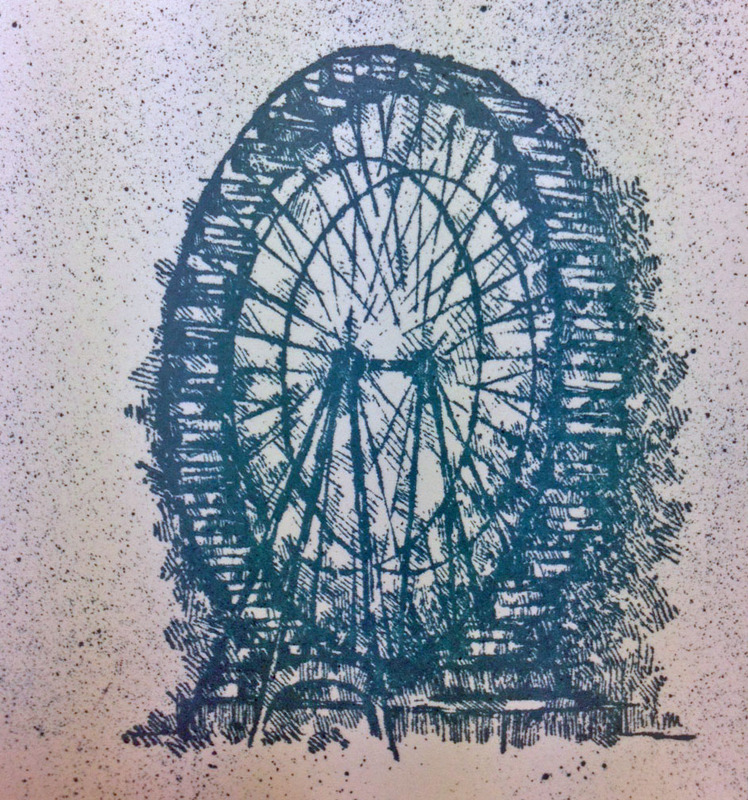 The background was created by stamping the "En Francais" stamp in Island Indigo Ink. "Tone on Tone" stamping can give you such a striking effect. I really enjoy using it. Ok...now for a really fun technique.... the "Grid" technique. I started with a scrap of Whisper White card stock. I used my diagonal plate for the Simply Scored tool. Now, you can choose whether to score your lines horizontally and vertically or score them diagonally. You can also choose how far apart they will be. Mine were scored 3/4" apart on the diagonal (hence the diagonal scoring plate). Once the card stock has been scored it's time to stamp. I chose one that was just bigger than the image I planned to stamp. I inked up the empty block with Crumb Cake ink and stamped it directly onto the scored White card stock. Woot! Ok....as if that wasn't cool enough.... 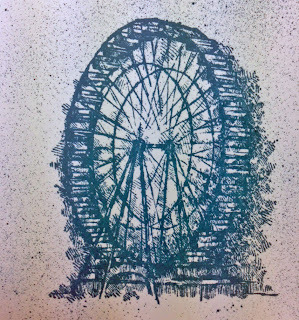 I then stamped the ferris wheel image from "Feeling Sentimental" in Pacific Point ink over top of the Crumb Cake image. VOILA! Now how stinkin' cool is THAT?? I love how it looks!! I just tore the edges and sponged them to give it a rustic feel. 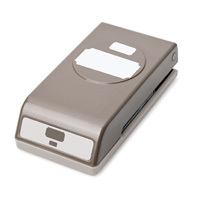 One of the BEST parts.....It has a matching punch! WOOT! Ok...I'm off to prep for Wednesday's "Just Cards" stamp camp. 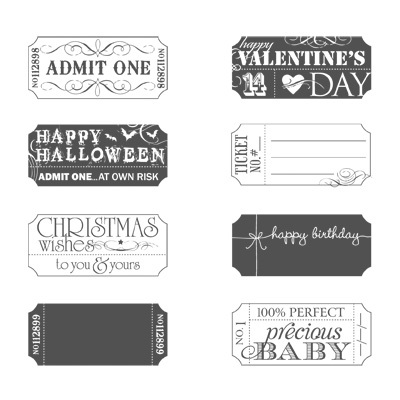 Have you stamped today? You can find these and SO many other fun stamps and supplies at my Online Store. 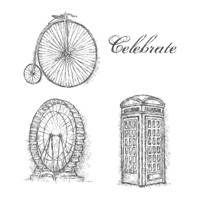 Don't forget....you can get the "Feeling Sentimental" Stamp Set (or 18 other items) for FREE now during Sale-A-Bration. 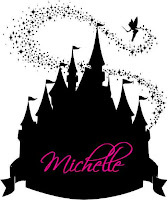 You will earn one freebie for every $50 in orders. You can't imagine how appropriate your card is! I live in the area that was devastated by Hurricane Sandy, which includes the seaside area of New Jersey. This would make a wonderful birthday card for anyone I know. Thanks so much for sharing.